The Body Rider Fan Elliptical Trainer is one of the hottest pieces of workout equipment on the market. With its sleek design, light weight, and small frame, it is suitable for anyone’s lifestyle. It fits perfectly into a cramped apartment or small house, and it can be moved around without too much of a trouble if needed. This elliptical trainer fits perfectly into anyone’s house and anyone’s budget. Available under $ 125, this elliptical trainer is one of the cheapest machines out there that will give you the good workout you’re looking for. With both pedals and handlebars, this elliptical will give you both a lower and an upper body workout that will help you strengthen your body and drop pounds. 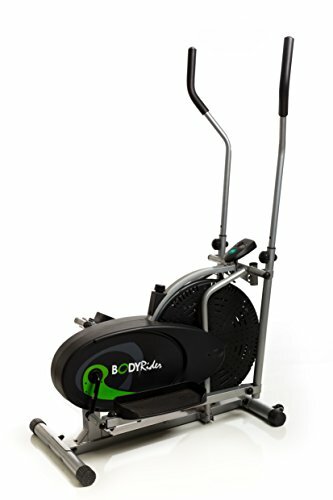 Overall, the Body Rider Fan Elliptical is a great, compact machine that will give you the workout you need for the price that your budget allows. If you live in a small house or an apartment with thin walls, this machine is perfect for your needs. While it does produce a small whirring sound, it is not as loud as other machines on the market. With a light weight, it can easily be moved from place to place without straining muscles, making it perfect for small living spaces. It can easily be put away when short on space. While it does have a limited range in motion, it can support quite a bit of weight, proving to be the perfect machine for anyone trying to get in shape and lose weight. This is the perfect machine for any budget. It’s definitely cheaper than a lot of other machines and it gives the same, if not a better, workout. If you’re looking for a machine that will give you the workout you want for the price your wallet needs, check out the Body Rider Fan Elliptical Trainer.